Sometimes we slip into the comfort of routine and do the same thing all day, every day. Today, I broke my Sunday routine of brunch - nap - idling - dinner - bedtime, put on my adventure cap and played tourist in the city I call home for 5 years. I took a trip to the splendid Royal Botanic Garden. Within the lush greenery, blooms were everywhere. Footsteps slowed down. Basking in the warm spring heat, children were free to run around with bare feet without fear of broken glass. Amidst the cool shades and low branches, lovers embraced. The sound of trams, cars and people were far away. The only sounds to be heard were the rustle of leaves, birds chirping/whistling and low murmur of speech. 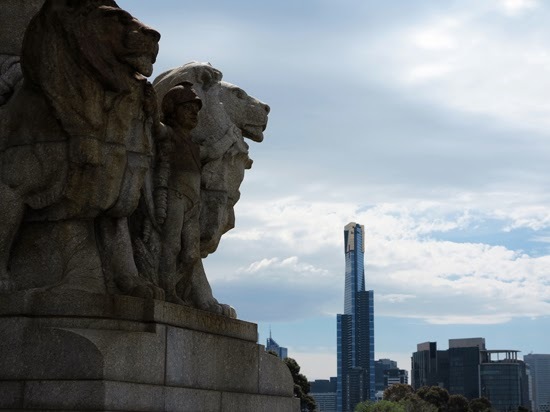 Before I entered the Royal Botanic Garden, I took a detour to the Shrine of Remembrance and captured the majestic lions overlooking Melbourne. There are many strange and exotic plants housed in the Royal Botanic Garden, aimed at giving visitors the experience of other region's landscape. Plants in places such as caleconia, New Zealand and even South China can be found in the Royal Botanic Garden. The Garden was huge and decorative ponds, benches and pavilion. It was easy to get lost. But instead of focusing on which path I was going to take, I let myself get lost and in turn, I discovered little surprises: something new and interesting at every turn. I was amused by the ferns below that looked like seaweed...or tentacles. And this... I can't even... what? This looks like something out of the movie "Madagascar" or a prop in a theme park. These colourful flowers do look like exotic birds, befitting their common name. I was in awe of how old some of the trees were. Just look at those branches. They are a work of art. Spring is such a lovely time. The Garden was covered in beds of little daisies such as these. They are the stuff I used to see on TV and movies. I used to dream of just laying on them as I idle the day away. Today, I took of my slippers and walked among them, feeling closer to earth than I have been in a long time. I entered the Garden weary but I exited with a deep appreciation for nature's beauty, re-energised and ready for another week. Being sun-drenched and sleepy like the little adventurer I was today, I am heading to bed. What about you? How was your weekend? These photos are amazing, thank you for sharing this beautiful place! !